Poppy Seed Chicken and Grape Pasta Salad is a fun and flavorful pasta salad to add to your lunch or dinner menu! You get tender bowtie pasta, hearty pieces of chicken, sweet grapes, crisp celery and crunchy almonds all coated with an irresistible creamy poppy seed dressing. It’s just so good! This year I’ve been allll about those pasta salads! I didn’t fully appreciate them until the last few years so I guess I’m just catching up. 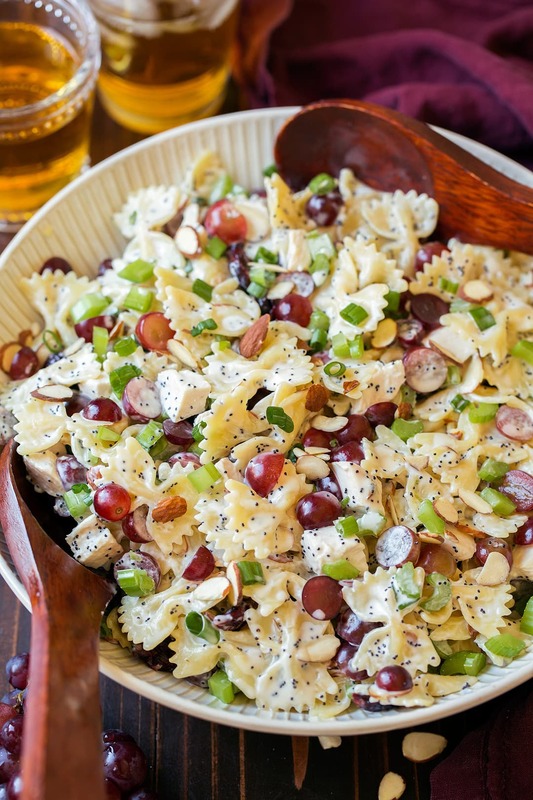 And now I’m thinking of fun pasta salad flavors I’ve never tried before, like this perfectly delicious Poppy Seed Chicken and Grape Pasta Salad! I’ll always go for a good poppy seed dressing when it’s an option so I knew it would be good added to a pasta salad, I also really love this Poppy Seed Chicken Salad recipe of mine. 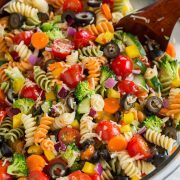 So I combined those two ideas together and here you are left with a perfectly summery super tasty pasta salad! It’s such a great side dish to serve at all your summer cookouts. Don’t Leave Out the Almonds! 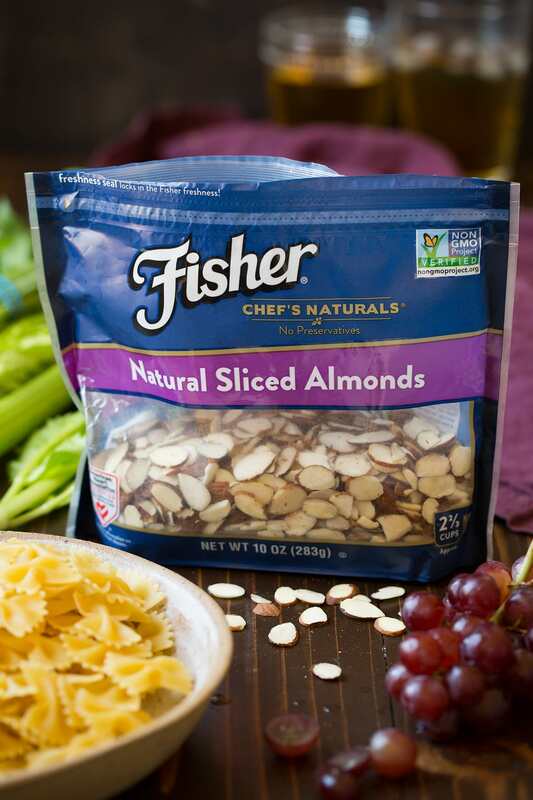 For this recipe I used Fisher Sliced Almonds and they are a key ingredient here. I love that they are preservative free and I also love the resealable packaging that helps them stay fresh! My family likes to snack on them plus we add them to so many things. My husbands favorite way to use them is in his protein smoothies, they blend up easily and they give it a creamy texture and make it more filling. 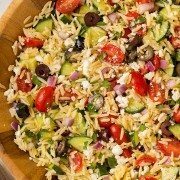 And one of my favorite way to use them is in salads, like so. I love that they are thinly sliced so you get that perfect thin bite with each piece for multiple layers of crunch! How do I Make this Poppy Seed Chicken Pasta Salad? Cook pasta, drain and rinse then set aside to cool. Whisk together dressing ingredients in a bowl. To a salad bowl add drained pasta, chicken, grapes, celery, almonds, green onions and cranberries. Pour dressing over and toss to coat, season with salt and pepper. Chill at least 30 minutes. Once you add the dressing there will seem like there’s too much, there’s not, it just needs time to rest and allow the pasta to absorb some of the dressing. So be sure to give it at least 30 minutes to rest. Can I Reduce the Sugar? 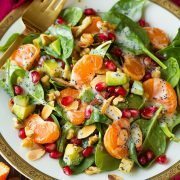 If you aren’t generally a big fan of the sweetness of poppy seed dressing then you can reduce the sugar or even omit it in this recipe. But I liked the unique sweetness it gave this pasta salad, plus it gives it that traditional flavor of poppy seed dressing. You can make this a day an advance and it’s still so delicious. That’s one of the great things about most pasta salads is that they can be made ahead. 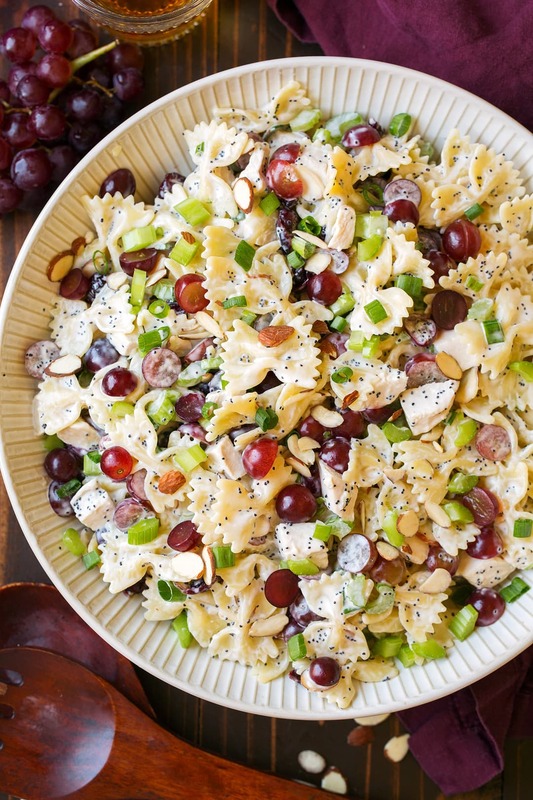 In this delicious pasta salad you'll find tender bowtie pasta, hearty pieces of chicken, sweet grapes, crisp celery and crunchy almonds all coated with an irresistible creamy poppy seed dressing. It's just so good! Cook pasta to al dente in salted boiling water according to directions on package. Drain then rinse with cold water and let drain completely. Set aside and let cool. In a mixing bowl whisk together Greek yogurt, mayonnaise, vinegar, honey, sugar, poppy seeds and 1/2 salt. 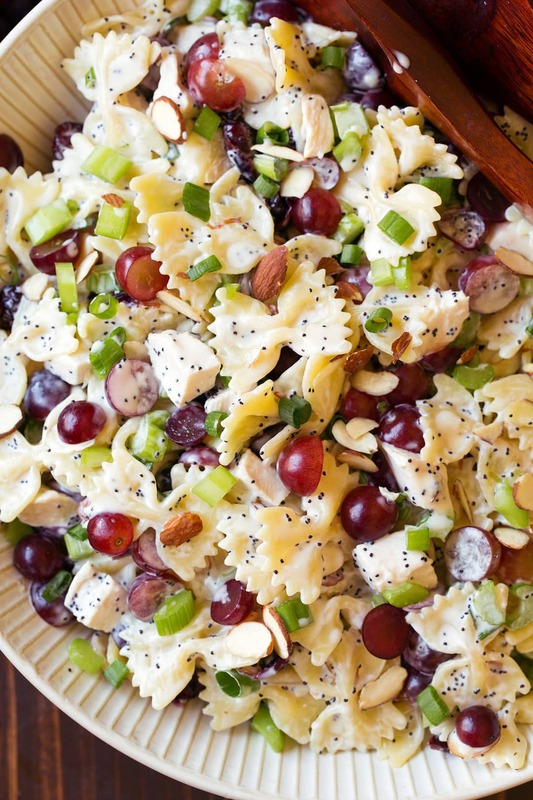 Add drained pasta to a salad bowl along with chicken, grapes, celery, almonds, green onions and cranberries. Pour dressing over top and toss to evenly coat. Season with more salt to taste and toss. Chill at least 30 minutes (and up to 1 day) before serving (this allows some time for the pasta to absorb the dressing and time for the flavors to meld). Serve chilled.